Coll. No. 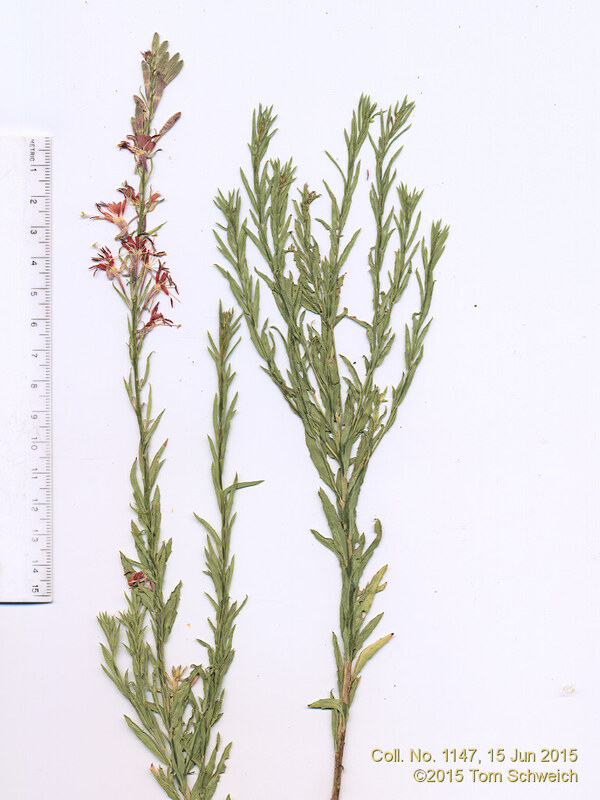 1147, 15 June 2015, characters observed: Perennial herb, to 40 cm. ; Stem, exfoliating brown layer proximally, very few eglandular hairs distally; Leaves, cauline, alternate, sessile, 21 mm. × 4.5 mm. wide, elliptic, margin toothed; Bud, appressed hairy; Sepals, 9 mm., reflexed; Flowers, solitary in bracted spike or axils; Petals, 4, 7 mm. × 3 mm. wide, clawed 2 mm., color red, without spots or streaks; Capsule, 4 mm., mature size and shape unknown; Seeds, unknown. Field Notes: Coll. No. 1147, 15 Jun 2015. Other photos about Species or Onagraceae Oenothera suffrutescens.